Freerice is a non-profit website that is owned by and supports the United Nations World Food Programme. Freerice was founded in October 2007 by John Breen. In March 2009 Mr. Breen donated the site to the UN World Food Programme. In making the donation, Mr. Breen expressed his hopes that Freerice will be able to grow over the coming years, helping to feed and educate as many people as possible throughout the world. To play the game, click on one of the four definitions ("little", "old", "big" or "yellow") that you think is correct. 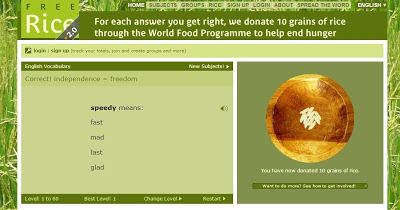 If you get it right, Freerice donates 10 grains of rice to help end hunger. In the example above, you would want to click on "little", which means "small". 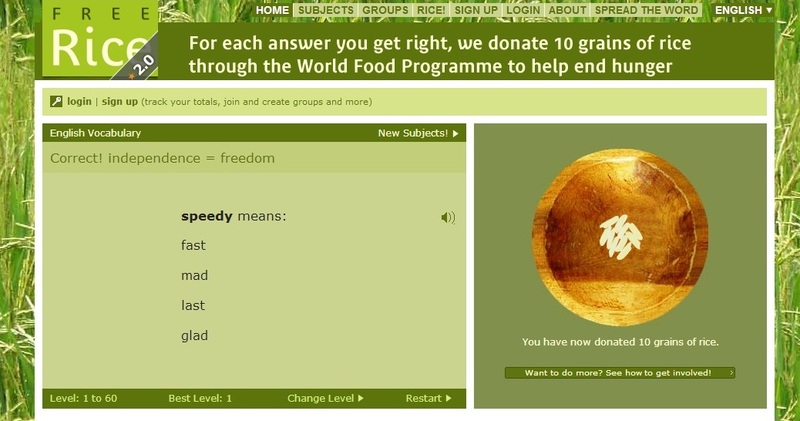 When you select the correct answer, you earn 10 grains of rice - your donation is automatically counted without any further action required on your part. You will then get a chance to play another question in the same way. You can play as long as you like and donate as much rice as you like. To track the rice that you earn and to join/create groups, please sign up. - Be more successful in your job. But if you get tired of vocabulary, click on the Subjects link near the top right of the page to see a list of all subjects available at Freerice. There is math, science, geography, art history, foreign languages and more. The goal is to provide knowledge that is useful and interesting for you. One last important thing you can do to help end hunger is to become knowledgeable about it. A good way to do this is to visit WFP, or one of the many excellent sites listed here. We believe that when enough people around the world become knowledgeable about hunger, it will no longer be tolerated. You have read this article Freerice / United Nations / World Food Programme with the title Free Rice 2.0. You can bookmark this page URL http://catolink4.blogspot.com/2012/11/free-rice-20.html. Thanks! 1 comment for "Free Rice 2.0"